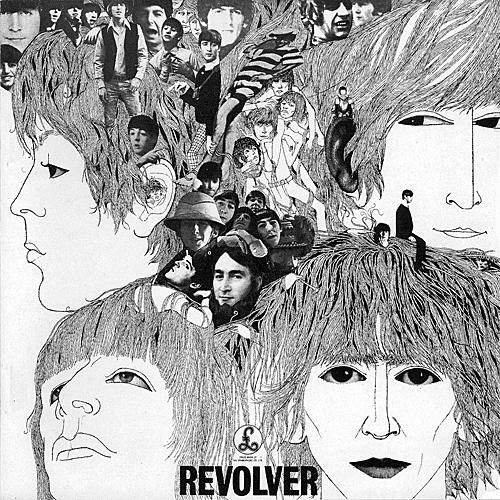 Desert Island Discs: “Revolver” by The Beatles (1966) | Name-Brand Ketchup. 1966 was a kickass year for rock albums, and quite possibly one of the best years ever for rock. Dylan, the Stones, the Beach Boys, the Kinks, the Byrds, the Lovin’ Spoonful, and Buffalo Springfield put out landmark records that year. In large part they were all trying to keep up with the Beatles, who quit touring that year to concentrate on record making. I think this is the best album they ever recorded. Better than “Sgt. Pepper,” better than the white album, better than “Abbey Road.” Arguably the last album on which they all played together as a group, and arguably the last album that was made up predominantly of rock’n’roll songs. Capitol Records, in their weaselly way, chopped up most of the Beatles’ UK albums as a way of spreading the same number of songs over a greater number of albums. If you’ve only heard the Capitol version, you’d think that Lennon didn’t contribute many songs to this album at all. Three of his songs had been released earlier by Capitol on a different album: “I’m Only Sleeping,” “And Your Bird Can Sing,” and “Dr. Robert.” This left him with only two songs on the album, each at the end of a side: “She Said She Said” and “Tomorrow Never Knows.” George had three: “Taxman,” “Love You To” and “I Want To Tell You.” Ringo sang “Yellow Submarine.” That left Paul with five: “Eleanor Rigby,” “Here There and Everywhere,” “Good Day Sunshine,” “For No One,” and “Got To Get You Into My Life.” The Parlophone UK version, the one currently in print, is a far better album. The Beatles were making music that they couldn’t perform on stage anymore. “Sgt. Pepper” may have gotten more attention, the white album and “Abbey Road” were mostly solo songs performed by each of them, but with “Revolver” they still enjoyed experimenting and playing together as a group. If you don’t own a single Beatles album, this is the one to start with. Boy, just looking at that album cover made my heart go pit a pat. I spent the entire year of 1967 playing this album over and over and over…every time I took it out of the sleeve my heart sped up with anticipatory joy. I knew every beat and every word of every song. Thanks for bringing a little of that excitement back. Somehow, just listening on my Ipod will never be as exciting as listening through all the pops and hisses of “Good Day Sunshine” while I lay on bed and looked at Tiger Beat.